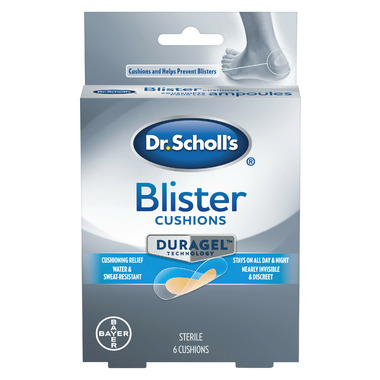 Dr. Scholl's® Blister Cushions with advanced DURAGEL™ Technology are thin and flexible cushions that conform to your foot to help prevent and protect painful blisters. Plus, they are nearly invisible — so you can use them discreetly. Advanced DURAGEL™ Technology uses a unique gel cushion that is thin and flexible. The cushion conforms to the contour of your skin and is nearly invisible, making it very discreet. Helps prevent blisters by reducing the friction and shoe rubbing that cause them. Sweat resistant, so an active lifestyle won’t get in the way of taking care of the blister.